On Friday, our family prayed together, then the kids and I laid hands on Sora and asked the Lord to watch over her and bless her work. Krys M., the director of the birth clinic here in Davao then drove Sora to the airport. She went first to Manila, where she stayed overnight because weather had delayed her flight. Then on Saturday, she boarded a plane to Tacloban, the capital of the province of Leyte. From there, she got a ride to Dulag, a smaller town where she will be working with a team of Filipina and international midwives in a field birth clinic. It is situated in a school building that was de-roofed by the super typhoon last year; though the building now has some roofing, the clinic is still in tents. There are 6 Filipina midwives and international volunteers, including a midwife from Poland and one from New Zealand. Sora texted me that traces of the typhoon’s devastation are still everywhere. She also said that she has no internet (expected), and that her cell phone only has reception in a certain 3-foot square. We texted for a while in that spot, but I’m not expecting further regular communications. Instead, Sora will be writing in a paper notebook with a pen and taking photos with her phone, and she will blog about the four weeks when she returns. If she texts me anything further before then, I’ll of course post it. 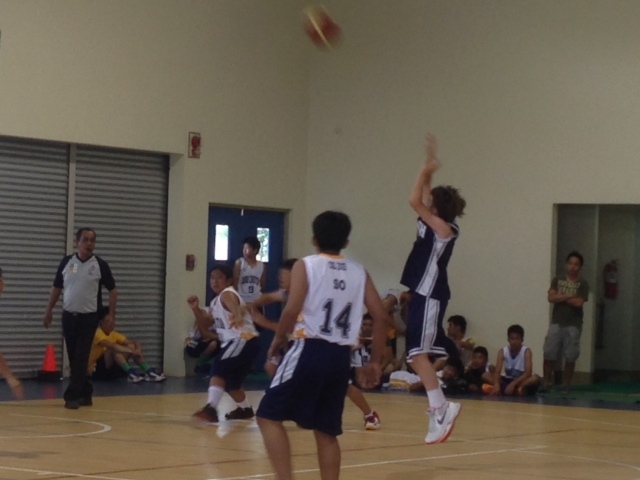 Ezekiel shoots a jump shot in happier days. He’ll be sitting on the bench for the rest of the season. Who needs a lead apron for a little old hand x-ray? The ER experience was smooth, easy, and efficient, an incredible contrast to understaffed, overcrowded ER at the public hospital where we usually bring any patients who need transport for higher-level care. Ezekiel was unquestionably the healthiest patient there but we were still seen immediately. 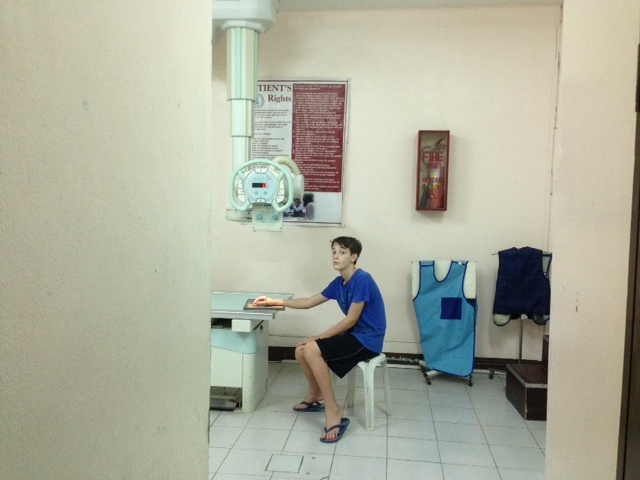 Within half an hour of arrival we had paid for our x-ray (in the Philippines, you pay first and then get treated: that’s why there’s no wait time in the ER) and Ezekiel was getting zapped. The radiology tech was surprised when I asked him to put the apron on my kid for just a hand x-ray. Probable diagnosis: chip fracture. 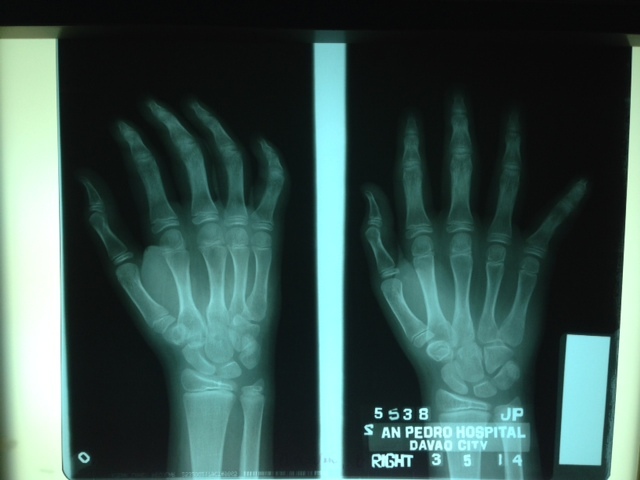 (They x-rayed the uninjured hand too to compare but I only got a photo of the first one.) 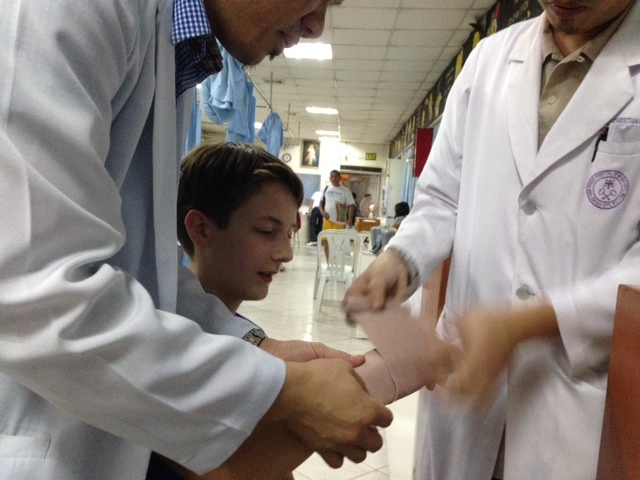 No orthopedists in house at 7 pm so Matt’s going to take him back tomorrow. The ER doctor offered to admit him so he could have first crack at the ortho in the morning rather than having to wait around in the outpatient clinic (Seriously? Seriously! “Since there is a fracture, we are allowed to admit him.”) This was obviously overkill so I said we’d just come back tomorrow. They settled for immobilizing the hand and finger (which Ezekiel considered excessive), telling us to keep icing, and writing a prescription for mefenamic acid which we probably won’t bother with since the swelling is fairly minimal (post title notwithstanding) and he’s not in pain unless he tries to move his finger. The most remarkable part of the whole thing (besides being in and out and home in about an hour and a half, half an hour of which was spent driving?) Total bill for ER visit with x-ray: 823 pesos. (At today’s exchange rates, that’s USD$18.39.) Plus $0.65 for the bandage. Except… that this is at the expensive private hospital that very few families can actually afford to go to. It’s still hard to fathom that what seems like such a small amount to us is an insurmountable barrier to care to so many others.